A 14-year-old girl wounded during the shooting rampage in Kalamazoo, Mich., was declared brain-dead and about to have her organs harvested when she suddenly showed signs of life, according to a new report Monday. Michigan State Police Lt. Dale Hinz told ABC that the girl’s family said Bronson Methodist Hospital was preparing to remove the girl’s organs for donation when she squeezed her distraught mom’s hand. The girl squeezed her mother’s hand again when the mom asked if her daughter could hear her, Hinz said. She also gave thumbs-up signs with both hands when a doctor asked her to give him a thumbs-up if she could hear him, Hinz said. CONEJOS – In the aftermath of a fire at Colorado’s oldest church, an image appeared that some parishioners consider a miracle. Overnight on Ash Wednesday, fire caused smoke damage at Our Lady of Guadalupe Church. The Conejos County sheriff believes it was an accidental electrical fire. Not long after, an investigator surveying the damage noticed the image of a crown above a portrait of the Virgin Mary, according to Father Sergio Robles. The father says since word has spread, parishioners have told him they consider the image a miracle. They would like to see it preserved while the church repairs damage to the rest of the building. The Catholic Church has rules about classifying something as a miracle, Fr. Sergio says. While he won’t say whether he agrees with his parishioners, the father says he hasn’t seen anything like the crown image during his seven years at Our Lady of Guadalupe Church. 1946 was the year of Portugal’s third centennial of national consecration to the Immaculate Conception and it was the first centennial of an identical national consecration in the United States. Just one hundred years before . . . in 1846 . . . the bishops of America in a conclave in Baltimore dedicated our nation to Mary Immaculate. On that very day . . . the first centennial of America’s dedication to the Immaculate Conception . . . the day on which we had no fitting celebration of our Marian heritage in this nation discovered by a ship which bore her name and solemnly dedicated to her by the first Episcopal conclave . . . something else was happening in another part of the world. “The coming of the statue of Our Lady of Fatima from the Cova da Iria (where Our Lady appeared in 1917) to Lisbon, for the celebration of the third centenary of the consecration of Portugal to the Immaculate Conception, was too extraordinary to be adequately described. “The statue was carried to Lisbon and back to Fatima on men’s shoulders, the entire way, and in each village or town where it was kept during the night, great crowds spent the entire night in adoration of the Blessed Sacrament, culminating in early Mass and general Holy Communion. “Before I narrate the story of the doves in detail, I would like to describe the general events that centered around the statue upon its arrival in our capital city, Lisbon. “It is to be remembered that not many years ago the Catholic Church in Portugal was persecuted. That is why this centenary . . . this commemoration of the third time that Portugal celebrates a hundred year mark in her state of national consecration to Mary Immaculate . . . was to be so important. During this past century, not only had Our Lady saved Portugal . . . but it was in Portugal that She made Her predictions of World War II with Her ultimate promise of World Peace! “After its long journey (which for the people along the way seemed too short) the statue arrived in Lisbon on the evening of December fifth. Straightway it was carried to the beautiful new Church of Our Lady of Fatima of Lisbon, where it was kept until the vigil of December eighth. Crowds filled the beautiful church to the doors, constantly, day and night. All night long, adoration of the Blessed Sacrament was conducted by several priests. Celebration of Masses began at midnight and in the morning there was High Mass and general Holy Communion. On December 7th, at 3:00 o’clock in the afternoon, thousands of children were consecrated to Our Lady by Cardinal Cerejeira, Primate of Portugal. Finally, at 9:30 in the evening, in a brilliant candlelight procession consisting solely of men that reached almost from one end of central Lisbon to the other, the statue was carried to the cathedral. The passage took three and a half hours, so vast were the crowds. “After the Te Deum, all the bishops with their mitres and crosiers, regular and secular clergy and great crowds of many thousands of persons, conducted the statue processionally to the square, Terreiro do Paco, where the flag of Blessed Nuno Alvarez Pereira1 is annually saluted; there it was placed on a beautifully decorated frigate waiting at anchor in the River Tagus. Atop the main mast on the frigate flamed an illuminated cross, visible for miles. “On the opposite shore, another crowd was waiting. Soon the statue was again being carried processionally, on men’s shoulders, back to Fatima. “The scene of the departure from Lisbon was touching. I am sorry that I cannot adequately describe it. The great square, which is capable of holding many thousands of people, was actually illuminated by the number of candles. But in addition, flaming rockets constantly broke overhead and great searchlights wove back and forth across the sky. The crowd, many with tears in their eyes, waved their handkerchiefs and sang the adieu hymn which pilgrims always sing when leaving Fatima. Deep, throaty roars and whistle blasts from hundreds of boats echoed their cries. “Truly the reception of the statue in the city, and all the ceremonies held in honor of the Lady, Queen-Mother, which the statue represents, are beyond description. “Now, into this background of the greatness of the occasion, let me tell the incident of the doves, about which the newspapers here in Portugal have spoken so much and which is on the lips of every person in the nation. “It began in a town called Bombazral, a short time after the statue had left Fatima. “As part of the ceremony in that particular town, while the streets filled with people were singing hymns to Our Lady and pressing to be near the statue someone freed four white doves. The greater part of the crowd hardly noticed it. “After flying off into the air, three of the doves . . . instead of flying from the great crowd to some roof-top . . . made several evolutions over the statue and then suddenly, to the amazement of all who saw them, plummeted downwards, and alighted at Our Lady’s feet! “During the days that followed, midst ever-changing crowds, moving from one town to another night and day for almost two whole weeks, the doves did not leave the statue. They remained there at the very base of the statue, as though vying one with the other actually to stand on Our Lady’s feet. Yet bands played, people shouted, the bier on which the statue was mounted moved and swayed, rockets exploded at night and cascaded fire, while giant searchlights burned at them. They were constantly buffeted by flowers tossed to the statue from the surging crowds. “But they did not fly. They blinked, shook off flowers that hit them, occasionally stretched their wings to keep balance. But they remained there at her feet during the entire two-week journey. They refused food or drink. “When the statue was carried into Lisbon, I had the honor of walking at its side as Carmelite Tertiaries bore it triumphantly into the city. I was so close to it, and to the doves, that I could reach out and touch either. Cordons of militia and police were holding back the crowds of many thousands of people who had gone far out of the city to meet this most famous representation of the Virgin, coming for their greatest Marian centennial. “All during the night of December 5th, in the Church of Our Lady of Fatima of Lisbon, the doves remained standing at the feet of the statue. By now they were more the object of comment than the beautiful statue or the glory in which it was enthroned. The newspapers had been filled with the story of their perseverance, their utter fearlessness, the strangeness of their position. Many must have wondered what would happen . . . now that they had actually accompanied the statue into the church that had been prepared for its reception, refusing to be brushed off or frightened away. “The next morning, at Mass, they had their answer. “The next morning, the doves flew. “From midnight, Masses were constantly recited at the altar near the statue. As I mentioned in the beginning, the church was crowded to the doors with Lisbonites keeping vigil. “In the morning, after the many Masses of the night, came the solemn High Mass, which was to be followed by a general Communion. “During the Solemn Mass, most of the people in the great church had undoubtedly stopped watching the doves, to which they were now accustomed, to concentrate on the Mass. This was especially true in the solemn moment when the bell sounded, and a great hush fell over the crowd just before the elevation. “In that moment of hush, there was a sudden fluttering of wings. “To the utter amazement of all, two of the doves suddenly flew . . . after two weeks of refusing food or drink and of remaining at the feet of the statue . . . one sped straight to the gospel side of the altar, and the other to the epistle side! There, as the bishop straightened to raise the Consecrated Host, they alighted and folded their wings . . . one on each side . . . as though in adoration! “As the Mass progressed, the two doves remained there to the bewilderment of the celebrants and servers and the stupefied congregation. “But this was still not the climax. “The third dove had not left the statue. “Suddenly, at the moment of communion, the third dove flew up and perched on top of the statue’s golden crown . . . placed there by the cardinal Legate who personally represented the Holy Father the previous May 13 at Fatima . . . and as the celebrant turned and held up Our Lord, saying “Ecce Agnus Dei” (“Behold the Lamb of God”), it spread its white wings and held them open! “On arriving in Fatima, first it will have been carried directly into the great Basilica (which, I am told, is much grander than the people of America generally know) and there the Office of the Nativity will be sung by the seminarians of the Diocese of Leiria (in which Fatima is located), and their bishop . . . Don Jose Alves Correia da Silva, who last August 13th greatly honored Americans by having you kneel alone beside him during the official pilgrimage of the Leiria diocese . . . will close these centennial celebrations of Portugal by giving the Papal Benediction to a crowd which probably will number at least half a million. “Here in Portugal, where we have witnessed this extraordinary event and where we have so come to appreciate the blessings of peace which we attribute solely to our newly awakened national devotion to Mary, this miracle of the doves has not only strengthened our confidence, but has renewed our purpose. “I hope that it may strengthen the confidence of the people of America, to whom so much of battered Europe now looks for leadership, and renew the desire and purpose of all American Catholics to strive for the world-wide fulfillment of Our Lady of Fatima’s simple conditions of peace. Arrival of Padre Pio to the Basilica of San Lorenzo fuori le Mura,amazing video. Start at the 5 minute mark.St Padre Pio Pray for us. On Super Bowl Sunday, proud adoptive mom Leigh Anne Tuohy will watch her son play football for the second time in the biggest American sports game of the year. Tuohy’s son Michael Oher is the offensive lineman for the Carolina Panthers and formerly the Baltimore Ravens, who he helped to achieve victory in the 2013 Super Bowl. Oher’s life had a troubled beginning. When Oher was born, his mother was addicted to drugs and his father was in prison. He struggled in school, moved through homes in foster care and spent time homeless until he met Leigh Anne and her family as a teen. Adopting a teenage boy was no small decision for the Tuohys, but the family welcomed Oher into their home, invested time into helping him with school and encouraged him to pursue his love of sports. The “hell house” in Gary, Indiana, that many suspected to be at the center of demonic activity has been torn down. Zak Bagans, host and producer of Ghost Adventures, bought the demon home for $35,000 in 2014 and then had it demolished two weeks ago for a documentary he’ll release later this year, Bagans told the Indianapolis Star. Bagans bought the hell house shortly after reports surfaced that Latoya Ammons and her three children claimed to have been harassed by demons. Her outcry prompted an investigation by local police and the Indiana Department of Child Services, as well as a series of exorcisms that a priest claimed were the first authorized by the bishop of Gary, Indiana. Much of Bagans’ footage was taken inside the demonically possessed home. Ammons described strange occurrences inside the house including a massive swarm of black flies, the sound of footsteps climbing the stairs, and the creak of doors opening by themselves. Ammons claimed that her children were picked up and thrown against walls by an unseen force, while she herself had been chocked and black monsters had appeared in the house. The ghost of a woman with red eyes and a hood also appeared, as did an odorless oil while the family’s three children chanted satanic verses convulsively and the little girl reportedly levitated off the bed. Ammon’s story went viral and a horde of movie producers and reporters flocked to Gary, Indiana, along with a number of sightseers hoping to catch a glimpse of the demons. Ammons, however, had no idea her story would generate so much publicity, she told the USA Today. People stand around the mortal remains of Saint Pio (Padre Pio) as they are displayed in Rome’s San Lorenzo Basilica, as part of the Roman Catholic Church 2016 Holy Year celebrations, Feb. 3, 2016. 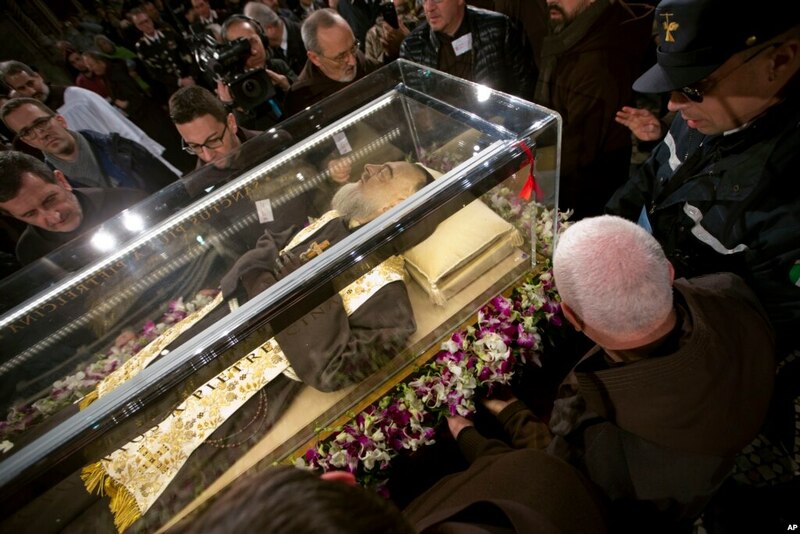 SAN GIOVANNI ROTONDO, ITALY—The body of one of the most popular Roman Catholic saints, the mystic monk Padre Pio, began an overland journey in a crystal coffin on Wednesday to go on display at the Vatican. The Capuchin monk who died in 1968 and is said by the Catholic Church to have had the “stigmata” – the bleeding wounds of Jesus on his hands and feet – was exhumed in 2008 in San Giovanni Rotondo, the small, southeastern Italian town where he spent most of his life. His body was partially reconstructed with a life-like silicone mask and preserved in a large, temperature-controlled glass reliquary so the faithful could view it. Pope Francis wanted the body of man who spent most of his life hearing confessions and who was declared a saint in 2002, to be displayed in St. Peter’s Basilica during the Catholic Church’s current Holy Year on the theme of mercy. But not all of the locals in this small town whose economy revolves around the pilgrim trade were happy that the saint was going on the road. The shrine draws close to a million people yearly. The body, along with that of another, less famous saint that is being transported to Rome from northern Italy, will be displayed in a Rome church before both are moved in procession to St. Peter’s on Friday. They will return to their regular locations later this month. Many people said the brown-robed Padre Pio was able to predict events in their lives and knew what they were about to confess. There are thousands of “Padre Pio Prayer Groups” around the world. Blessed Alexandrina Maria da Costa (FULL FILM) 1 hour long. Known to many as the Fourth Seer of Fatima. Full film of Blessed Alexandrina da Costa by Mary’s Dowry Productions – the life of Portuguese Victim Soul, a Living Miracle of the Eucharist and known to many as the Fourth Seer of Fatima. Available on DVD from our website – Mary’s Dowry Productions. A miracle in Phoenix, Arizona, has been attributed to the intercession of the hermit of Annaya, Lebanon. The day after visiting a holy relic associated with the saint, Dafne Gutierrez woke up with very itchy eyes and feeling a lot of pressure on her head and eye sockets. In the glow of a nightlight, amazed, she cried out to her husband, “I can see you. I can see you”. Beirut (AsiaNews) – A blind woman has been healed in Phoenix, Arizona, thanks to the intercession of Saint Charbel (Sharbel) Makhlouf (8 May 1828-24 December 1898). Thus, the reputation of miracle worker of the hermit of Annaya (Lebanon) is spreading around the world, or at least, wherever fate has taken the Maronites, scattered by the winds of their turbulent history. The city of Phoenix, capital of the US state of Arizona, has been the scene of one of those amazing miracles whose secret only Saint Charbel knows: the healing of a Hispanic American woman, 30-year-old Dafne Gutierrez, mother of three, who had lost her eyesight to Arnold-Chiari malformation. Phoenix is ​​a city with a large Lebanese community, mostly Maronite. The local Maronite church is dedicated to Saint Joseph and Masses are celebrated in three languages: Arabic, Spanish and English. Saint Joseph Maronite Catholic Church is the hub of one of the 36 Maronite parishes in the United States, divided between the two big dioceses of New York and Los Angeles. The relic of Saint Charbel, who has toured the various parishes since early October 2015, consists of a bone sample kept in a cedar chest. This pilgrimage marks the 50th anniversary of the beatification of the great Lebanese. The pastor of Saint Joseph, Wissam Akiki, had publicised as much as he could the relatively short visit (15-17 January 2016) the relic had to make in his parish, which coincided with a retreat for priests in the presence of the Maronite Bishop of Los Angeles, Mgr Elias Abdallah Zeidane. Diagnosed with Arnold–Chiari malformation at the age of 13, Dafne Gutierrez over the years developed papilledema (swelling of the optic disc swelling) at the end of the optic nerve. Surgery to correct the malformation had proved unhelpful. In the fall of 2014, she lost the use of her left eye, which had gradually weakened a year earlier. In November 2015, the right eye was also lost, which plunged her into total darkness that even sunlight failed to break when she looked at it directly. A medical report eventually concluded that her blindness was irreversible and that she required permanent medical assistance. Ms Gutierrez even envisaged moving to a residence for the blind, so as not to be a burden on her family. Over the weekend of the 16th and 17th January, motivated by Fr Akiki’s posters, relatives encouraged Ms Gutierrez to ask for healing. One of them took her to the priest on Saturday, 16 January. “I put my hand on her head, then on both eyes, and I asked God to heal her through the intercession of St Charbel,” the clergyman said with much fuss. On Sunday, Dafne and her family attended Mass and then went home. “Three days later, an ophthalmologic examination noted the miraculous healing. By then, five doctors had already examined Dafne Gutierrez, including one ophthalmologist of Lebanese origin, Dr Jimmy Saade. The healing defies scientific explanation. Popular faith does not have such scruples. News of the healing of a blind woman in Phoenix spread like wildfire and made it on US and Mexican regional TV channels. As a result, thousands of visitors began arriving at Saint Joseph Church, whose pastor wisely set aside a special intercession day on the 22nd of each month, like in Annaya, since the amazing healing of Nohad El Shami (22 January 1993). After touring the United States, the reliquary of St Charbel, was brought back to the Maronite Diocese of Our Lady of Lebanon in Los Angeles, following two final stops in Detroit, where the local Chaldean community honoured it, and Miami (Florida).